We have 28,000 registered participants from 190 countries. They are linked through 350 self-organizing Hubs across cultures, forming 700-1,000 coaching circles to co-create an inspired web of connections with change makers across society’s sectors and systems. Below is the first account of a bold experiment called MITx U.Lab, designed to transform higher education as we know it. The current crisis in higher education has three characteristics: it’s overpriced, out of touch (with society’s real needs), and outdated (in its method and purpose). But the solution, a true 21st-century model of higher education, is already emerging: it’s free (or accessible to everyone), it’s empowering (putting the learner into the driver’s seat of profound personal, professional, and societal renewal), and it’s transformational (providing new learning environments that activate the deepest human capacities to create — both individually and collectively). Today I would like to share some preliminary insights from our ongoing experiment, “U.Lab: Transforming Business, Society, and Self” (Watch a 7-minute video about it here), a Massive Open Online Course (MOOC) developed with MITx and delivered through edX.org. A frequent criticism directed at MOOCs is that the learning that happens in them is not as effective as the learning that happens in a classroom. That’s why, in the U.Lab, we didn’t try to replace the classroom. Instead, we decentralized it, then took the learning out of the classroom altogether. The U.Lab is a hybrid learning platform that offers the best aspects of MOOCs, which are democratizing access to education globally, while also eliminating many of the major criticisms of MOOCs — that they offer mostly superficial learning experiences. I spent a few hours this evening with two older…homeless men who are regulars in my neighborhood. Most days, I walk by these guys thinking that I know what’s what and have it right, discounting what they might have to offer because they are the ones panhandling. I felt humbled and chagrined to realize that this wisdom has always been there for me – but that I have not been open to it because of the packaging… Looking into their eyes tonight, really SEEING them for the first time, seeing in to their souls, it made me want to cry because, GOD, there was such beauty there – as there is in all of us. This course is having a profound impact on my day-to-day life. I’m significantly more aware of when my heart is ‘closed’. We are creating this world with every thought, every conversation, and every action. Not wanting to be naïve, but this does create a lot of opportunities for starting with self. I’ve never spoken to someone I don’t know on video as a first means of contact before, and after I overcame my initial shyness I found the experience empowering… Within an hour and a half our circle reached such a deep level of connectedness and trust, it was as if we knew each other since ages. More than 350 place-based Hubs around the world are forming and learning from each other in real time. Some of the Hubs where hosted by government (including in China and the US), by companies (including Eileen Fisher, Google, Alibaba and ICBC), or by civil society organizations (such as WWF) or universities. In India, participants reported “never [having] had such an authentic conversation in Mumbai, ever.” Former strangers are connecting across cultures in deep dialogue sessions that many of them have referred to as life-changing experiences. 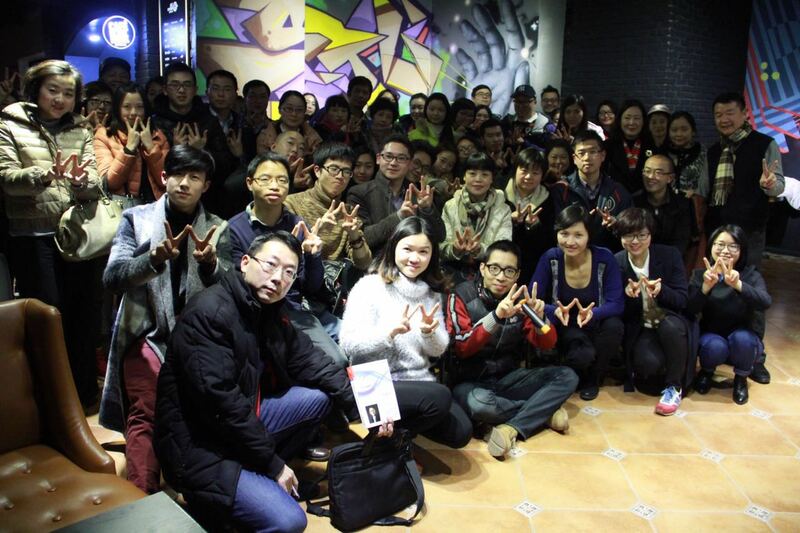 A host in Western Australia expressed amazement at “the depth of insights that are beginning to come up in the group already.” In China, a U.Lab Hubs have formed in at least a dozen cities, including Beijing, Shanghai, Chengdu, Nanjing, Hangzhou, and Shenzhen–each of them facilated by volunteer TAs who among themselves have their own learning circle to share experiences in real time. (5) Tools: Provide methods and tools for co-sensing and co-shaping the emerging future. The backbone of any educational endeavor is its methodological grounding. The U.Lab is grounded in a set of evolutionary frameworks and tools that integrate innovation, leadership, and systems thinking from the viewpoint of an evolving consciousness (Theory U). One example for a tool is the case clinic process that allows the coaching circles to go through a seven step process of deep listening, mirroring, and generative dialogue, within 70 minutes. The instruction for the coaching circle is really powerful. It facilitates skipping the advice and trying to quick fix. By only sharing the images, feelings and gestures it is feedback as pure as it can be. And from a personal experience I can say: the impact is unbelievable. As I wrote earlier after being the case giver “everything is different”. But also when others shared their case I was touched and transformed myself as well. (6) Deep Data: Move from big data to “deep data.” All deep system interventions are based on activating what I call “deep data” through a process that makes a system sense and see itself. All true transformative learning environments are built on the same principle: providing mechanisms that help learners see themselves through the eyes of another–both individually and collectively. In the U.Lab we hosted three live-streamed classroom sessions with approximately 10,000-15,000 thousand participants from across the globe. The sessions included mini-lectures, guided meditation, and collective real-time knowledge creation. A powerful example of this collective awareness creation happened midway through the Lab journey when we asked the participants to assess their ability to listen, converse, organize, and coordinate. We then asked them to consider the challenges that they currently face and how they need to operate in order to appropriately address them. Almost all of them said they needed to operate on a deeper level. Then we asked, What is holding you back? Thousands of participants responded with three words: fear, greed, and ignorance (see wordcloud). I shared these data with some colleagues from Bhutan, who told me that fear, greed, and ignorance are the three poisons that Buddhism has known for millennia. 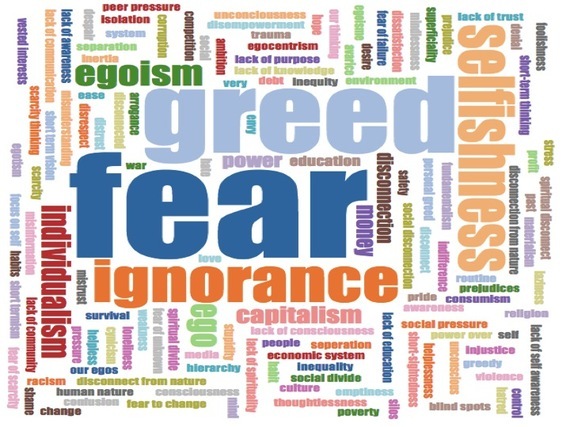 They constitute the essence of our current global leadership challenge: transforming fear to courage, greed to compassion, and ignorance to inquiry. (7) Social Fields: Closing the feedback loop between collective awareness and collective action. In spite of significant challenges, including three blizzards that shut down Cambridge and MIT just as we were about to run global live sessions, this experiment is working nevertheless. Why? 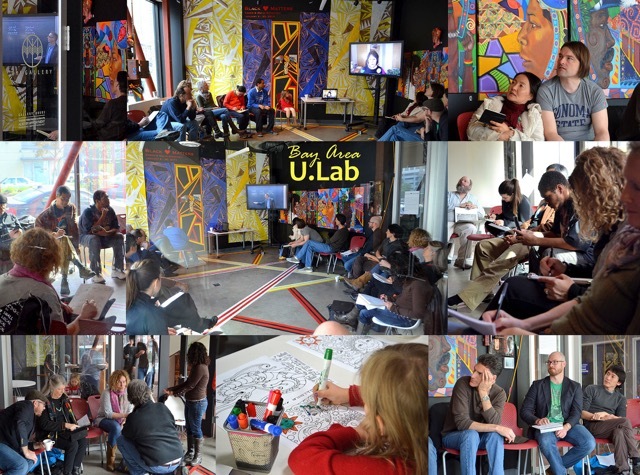 Because we organized the U.Lab around activating a global social field. By global social field I mean the sum total of connections that we as human beings enact in any given system. The power of the U.Lab lies in activating the social field as a mirror and teacher. We all engage with this global social field in our everyday interactions. But rarely do we have the opportunity to sense the whole global social field beyond the boundaries of our own habitual perceptions–and to see ourselves through the eye of another. The social field that the U.Lab is organized around functions as a mirror that empowers individuals to see themselves through the eyes of others, and that nudges individuals to open their minds and hearts towards holding the whole social field, and not just small parts of it. In the Inclusion world this experience is supporting people to transform their roles from beleaguered, tired, invisible, and depressed drudgery, towards enlivened activism fed by underground roots and streams of resourcefulness, renewal, courage and bravery that comes with seeing and feeling self in a bigger context. Stepping back, what are we learning? We see that the emerging 21st-century model of higher education is an inversion of the 20th-century model in that it places the learner in the driver’s seat of personal, relational, and institutional renewal. The challenge of this approach is to spark inspiration in “the driver” (the learner). That spark is the missing aspect of higher education as it exists today. We can activate it by helping learners to tap into their deeper sources of knowing: Who am I? What am I here for? What future do I want to co-create moving forward? 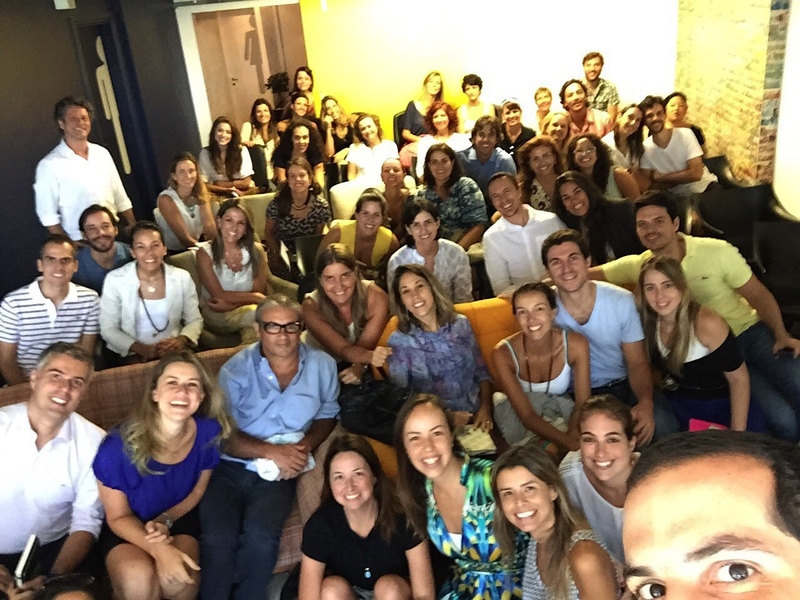 The U.Lab is a small first step into this new global territory. We don’t yet have any idea how big the opportunity is to reinvent education by engaging the global social field more intentionally as a mirror and a partner for co-sensing and co-creating the emerging future. But it does feel like a significant beginning. 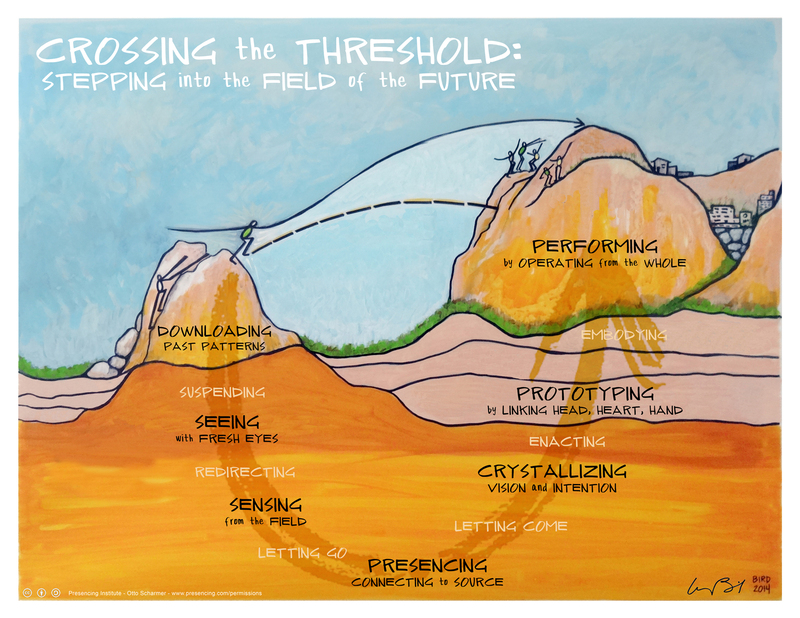 Most of the coaching circles, Hubs, and learners are now organizing around countless prototyping initiatives that they will pursue going forward–way beyond the formal end of the class. I want to thank the entire U.Lab team for co-creating U.Lab: my colleague Adam Yukelson for leading the effort and co-designing the architecture, Kelvy Bird for her amazing images that shaped the whole Lab, Ela Ben-Ur for blending Design Thinking with Theory U related tools, Lily Steponaitis for facilitating the practitioner case sessions, Lili Xu Brandt, Julie Arts and Marian Goodman for co-facilitating the hubs across world regions, Chris Boebel for being our filmmaker and creative partner for the course videos, as well as Peter Senge, Ed Schein, Dayna Cunningham, Arthur Zajonc, Isabel Guerrero, Eileen Fisher, Nipun Mehta, Michelle Long, Martin Kalungu-Banda and many others for being such a great co-faculty in this Lab–and most importantly, all the U.Lab participants for co-creating U.Lab as a dynamic blend between education and global movement building!